Neutrino Networks Inc. is an information technology consultancy company that specializes in supporting the computing infrastructures of numerous clients. Its services include network monitoring, backup recovery and desktop support. Neutrino prides itself on maintaining long-term business relations with its clients. The company sets itself apart from other firms by focusing not just on technology it offers, but how it can produce positive business results for its clients. The organization believes having a solid computing infrastructure is key to its clients achieving their core business goals. Exclaimer Cloud - Signatures for Office 365 really ended up saving the day. More and more emails are being sent from mobile devices as organizations begin to support Bring Your Own Device (BYOD). Maintaining a consistent email signature across multiple devices isn’t an easy task. Companies either have to setup complicated Office 365 Transport Rules or rely on their employees to setup their own email signature on their devices. With hundreds of users in different locations using different mobile devices, it was important for Neutrino Networks to find a way to manage every user’s email signature. 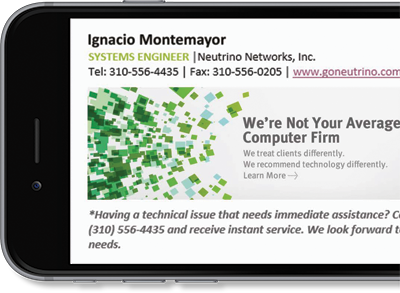 "We had tried to implement a manual solution in order to standardize Office 365 signatures across our entire organization,” said Ignacio Montemayor, Systems Engineer at Neutrino Networks. “This had proved difficult as many of our users send emails via multiple devices such as desktops, laptops, mobiles and tablets". When Neutrino Networks began the process of migrating to Office 365, Exclaimer Cloud - Signatures for Office 365 had not yet been released. “We had to plan for multiple versions of our signatures using several different mechanisms, which proved to be spotty at best. Luckily, Exclaimer’s Office 365 signature solution was released just three weeks before we finished our migration to Office 365. Exclaimer Cloud - Signatures for Office really ended up saving the day,” stated Mr Montemayor.